So some of you already know I am participating in Melissa at Happy Quilting's Star Surround QAL. If you don't know anything about it, you can read my original blog post about it here and my weekly check-in here. Please ignore big relish's room...it has the cleanest carpet since the dogs aren't really in there much.....BUT doesn't it look fun! I just laid out the pieces to see how it would look and the center star is the only part that is pieced. I might jump ahead before next week to piece it, but I am also trying to get the last 4 swoon blocks in this week as well. I was able to cut out the last 4 last night and hope to piece the rest of them this week. I am so excited to get both my Star Surround and Swoon tops finished! Yippie! Thanks girl! Im so glad I have some more FQ left for either the back or another quilt! Hi - coming over from WIP Wednesday! I'm also doing both the Star Surround and Swoon quilts. :-). Love your fabric choices for the Star Surround. Looks great! Yay for summer QALs! I just hopped over to your blog and realized you have the Lucy's Crab Shack swoon! I love that fabric! I did big relish's nap mat in it and get to enjoy it all year long! Thanks for stopping by and leaving a sweet comment! Your block/quilt looks great! I can see why you wanted to jump ahead and lay it all out. I have a few blocks of mine laid out now to see it all put together. Love your fabric choice. Thanks! Glad Im not the only one ;) I still debating on putting it all together this weekend. I fist need to finish my last three swoon blocks. They are cut and ready to sew. Thanks for stopping by and leaving a comment! I love this idea of one huge block making up the quilt. The end result is so fabulous. I love how this is coming together. Thanks so much! I put all the cutting details on my weekly check-in post (linked above) if you ever decide to go bigger! LOVE IT!!! Love the fabric you picked!!! THANK YOU! I am so pleased with my fabric choices! This line is just so beautiful. I am glad I still have more FQ and scraps left of this one to make other lovelies! It is looking great! 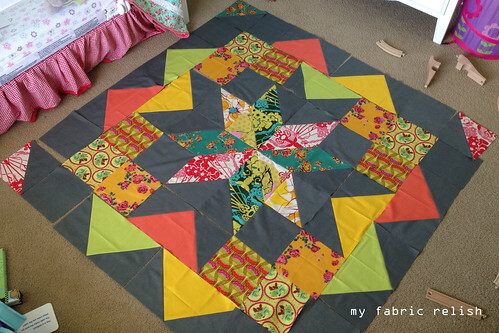 I am in this QAL too and was excited to see yours laid out fully...cant wait to get mine put together!! What a great quilt! I love your colors!